How crazy is it that in South Africa, 21% of young adults are not taking proactive steps in lowering their blood sugar levels while the older generation is more proactive in taking care of their hearts? A just-released survey, which was conducted by SA’s leading cardiovascular medicine provider to determine how heart-aware South Africans are in the lead up to Valentine’s Day, revealed that nearly a quarter described their relationship with their hearts as ‘on the rocks’. Of the 2 000 respondents that participated in the poll, almost half (46%) pleaded guilty to activities that put them at risk of heart disease, which includes smoking and drinking too much alcohol, overeating, consuming too much salty, sugary and greasy foods, whilst also living a sedentary lifestyle. Nicole Jennings, spokesperson for Pharma Dynamics says the findings are telling of the nation’s trivial attitude toward heart-health. “Unfortunately, it usually takes someone we know to have a heart attack or stroke before we take our own heart-health seriously. While certain genetic risk factors for these conditions cannot be prevented, modifiable risk factors that relate to lifestyle account for the majority of heart disease, and a healthy lifestyle can help to prevent 80% of premature deaths from heart disease. With so many South Africans living with cardiovascular disease, it is imperative that people identify their individual risk factors,” she says. Some of my favourites are the Crispy Chicken Strips with a Roasted Chickpea Dip and the Spinach and corn bakes – find the recipe below.  Mix polenta or mealie meal, dried herbs and salt in a large, shallow dish and season to taste with pepper.  Heat 1 tbsp (15 ml) of the oil in a large frying pan over a medium heat. Fry chicken strips in batches, until just golden brown on both sides and cooked. The thin strips fry quickly, so don’t overcook them, as the chicken will become dry. Repeat with the rest of the chicken and oil.  Serve hot or at room temperature with lemon wedges and a sauce of your choice, such as a sweet chilli sauce. Enjoy chicken strips with salad ingredients, fresh fruit or left-over veggies like butternut.  Preheat the oven to 180 °C and line a small baking tray with foil. Pat chickpeas dry with paper towel. Place 1 of the tins of chickpeas with the garlic, 30 ml (2 tbsp) of the oil and cumin seeds in a large bowl and mix to coat the chickpeas.  Place the oil-coated chickpeas with the seasonings on the baking tray and roast for 15-20 minutes or until lightly golden brown.  Place roasted chickpeas with the oil and seasonings from the tray, in a large bowl. Add the remaining chickpeas, oil, ground cumin and lemon juice. Add 50 ml of the reserved liquid from the tin. Blend to form a chunky mixture and season to taste. Add more water, if you prefer a smoother dip.  Serve as part of a lunch with fresh veggies like carrots, celery, cucumber and green beans. It is also delicious spread onto bread, any sandwich or as a dip for wholewheat pita wedges.  Preheat the oven to 180 °C and grease a muffin pan.  Place all the ingredients in a large mixing bowl and mix until well combined. Season with lemon juice and pepper.  Divide mixture into muffin pan and sprinkle extra paprika on top, if preferred. Bake for 20 minutes or until set. Remove from the pan and allow to cool.  Serve as part of a light lunch with lemon wedges and a bean or lentil salad. Add avocado when in season. However, if you are dining out more often than not, then avoid anything battered, creamy, deep-fried, rich, velvety or sautéed (in butter). Also consider ordering one entrée to share, as many restaurants serve enough for two. Splitting the meal will keep you from overdoing it. Tip 2: Spend time with the one(s) you love: Sharing quality time with someone special, whether it be a lover, friend, family or a beloved pet, helps reduce stress on the heart. Tip 3: Take a walk, hike or dance up a storm: Aim for at least 30 to 60 minutes of heart-pounding physical activity to gain the maximum benefits. “South Africans can’t afford to wait until they face a health scare before they take action. 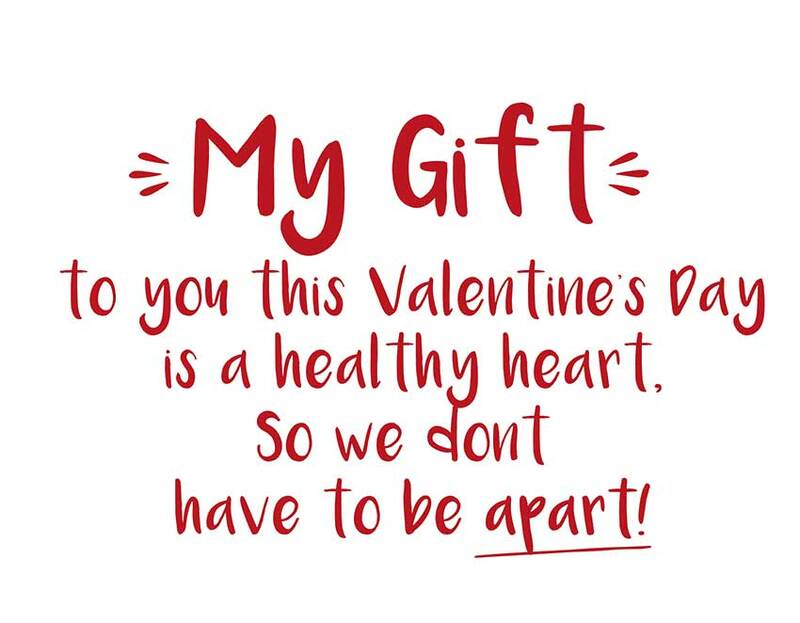 We can all take proactive steps now to reduce our future risk of heart disease, so vow to make this Valentine’s Day, a heart-healthy one,” says Jennings. Condolences on your Dad’s Death related to heart disease! Dear Vanessa, Thank you for that absolutely beautiful message. I really do appreciate you taking the time and effort to comment on my post. I hope you entered the competition?